Find the best deals on HP Color LaserJet CP1518ni printer toner to complement your creative and professional work. Whether you’re working from home or at your desk in the office, you know you can always get a quality performance out of this device. Printing up to 12 ppm (pages per minute), this laser printer churns out quality work that will look professionally done every time. However, getting professional print work requires a dependable, high-quality toner inside your laser printer. If you’re struggling to afford original equipment manufacturer (OEM) prices on HP 125A toner, fear not – 1ink.com is here to help. Our remanufactured HP toner cartridges will install in your printer just like an OEM cartridge, and they’re designed to give you the same user experience. From product specs like the page yield to the stunning quality print work you produce, these cartridges will give you the functional precision you need without costing you inflated OEM prices. Using remanufactured toner in your printer is safe and will not invalidate your printer’s warranty. 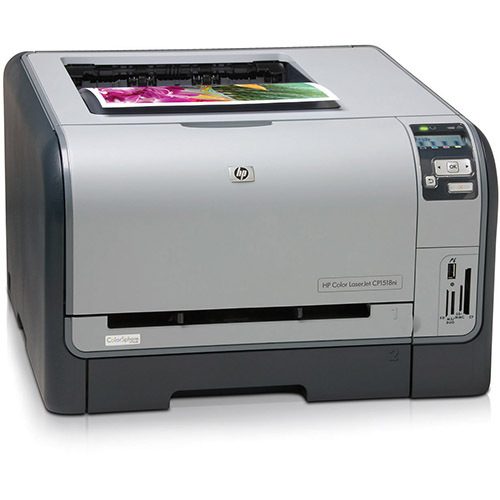 Scan through our selection of remanufactured HP Color LaserJet CP1518ni toner below and start saving with 1ink.com!